Town House, Inverness, with the old Mercat Cross outside (towards the left). Inverness's Town House or town hall was designed by local architects Matthews & Lawrie, and built 1878-82 on the corner with Castle Street. William Lawrie (c.1821-1887), who also designed the original Victorian Market in Inverness, was in charge of the Inverness office, while James Matthews (1819-1898) was based in Aberdeen, so it seems that the building was largely to his own designs. 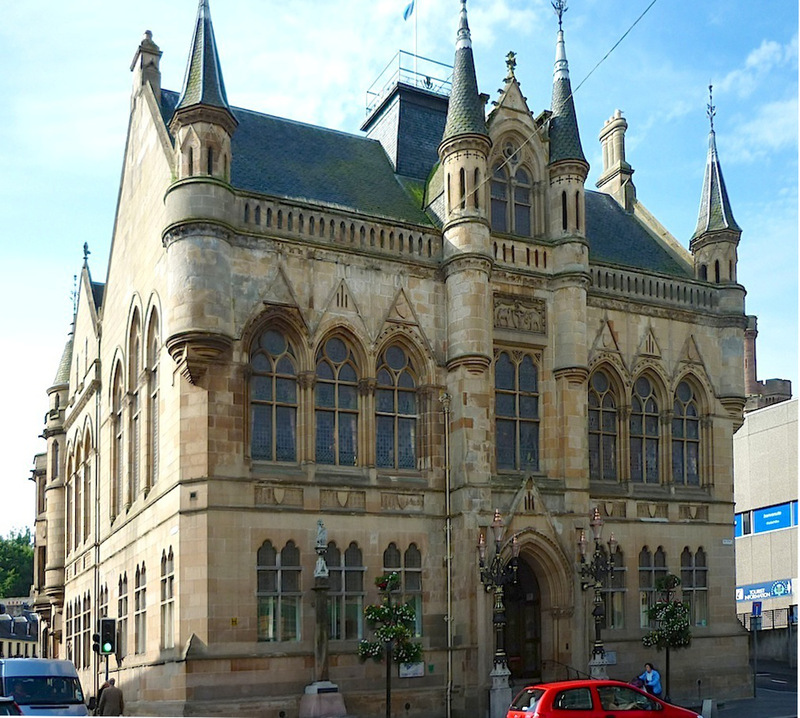 John Gifford describes the Town House, a Category A listed building, as a large version of George Gilbert Scott's Albert Institute (now called the McManus Art Gallery) in Dundee, pointing out that both are basically two storey Flemish-Baronial buildings with corner tourelles and a flèche, though the Town House's is "now truncated" (197). On the other hand, many other features of Scott's building are absent, most obviously the distinctive flights of steps that Scott designed at the main entrance in Dundee, but also the dormers, rose window and other ecclesiastical touches. Instead, the Inverness building has some heraldic devices on its façade. Both buildings were later extended, making it hard to compare them usefully now, but even in general appearance they are rather more different than Gifford suggests. Gifford tells us that the Builder was critical of the Town House at the time, finding its more decorative aspects "forced" (qtd. 197), but again this seems unfair. Since these pictures were taken, the Town House has been splendidly restored. It is currently used as the Highland Council's Inverness area office. 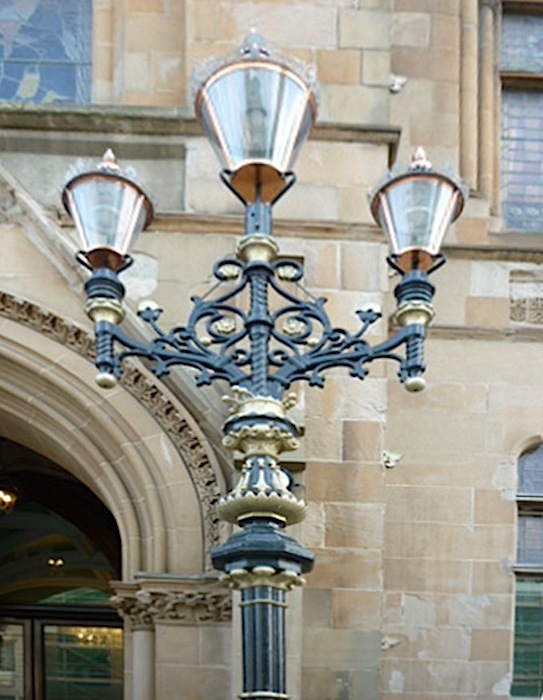 One of the ornamental lamp-standards outside. "Inverness, High Street, Town Hall British Listed Buildings. Web. 8 January 2018. "Inverness Historic Trail." Explore Inverness. Web. 8 January 2018. "Matthews & Lawrie." DSA (Dictionary of Scottish Architects). Web. 8 January 2018. "William Lawrie." DSA (Dictionary of Scottish Architects). Web. 8 January 2018.